9.6" x 9.7" stitched on 14 count. 7.4" x 7.6" stitched on 18 count. Asian Symbols Sampler cross stitch pattern... 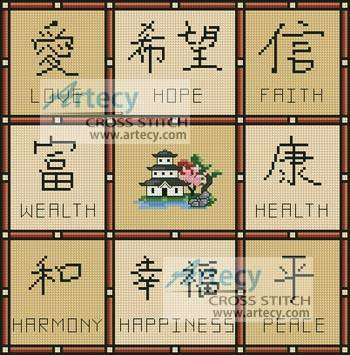 This counted cross stitch pattern of an Asian Symbols Sampler was designed by Artecy Cross Stitch. Stitch the whole design as a sampler or use the individual designs on greeting cards etc. Full cross stitches, Quarter Stitches and Backstitching are used.